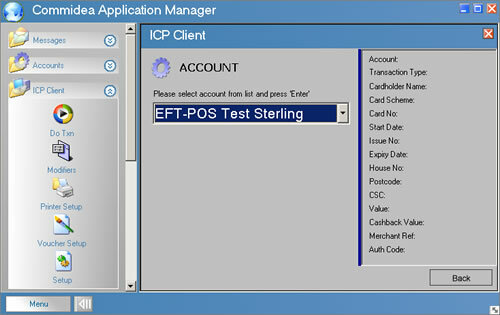 The ICP Client Program forms part of the EFT-POS Commidea Application Manager. 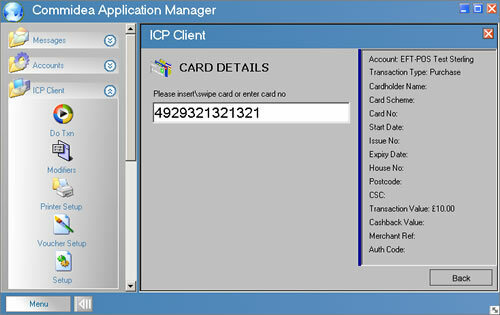 ICP Client is an optional snap-in to the CAM that enables credit and debit card tranasactions to be processed through a familiar windows based interface. 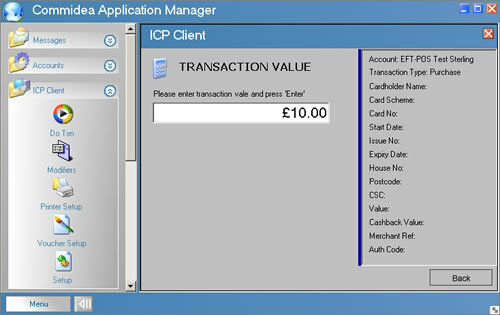 Within the ICP Client Program - shown selected here within CAM you can Choose: "Do Txn" to carry out an authorisation of a card transaction; "Modifiers" to determine whether the transaction is a particular type (e.g. pre-authorisation) and whether a default type should be set or the user should be prompted; "Printer Setup" to choose the default printer for any voucher printing required; "Voucher Setup" to specify voucher text if required and "Setup" to determine operational characteristics of the program. On choosing "Do Txn" you are prompted to press Enter to start a new transaction. When enter is pressed you will be guided through the information that needs to be entered in order to process the card transaction. 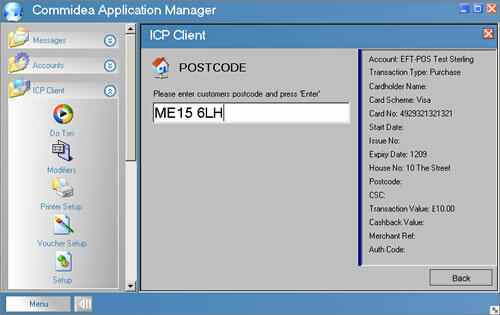 If you have more than one Merchant account set-up on your ICP system - for example if you accept transactions in multiple currencies - then you will be prompted to choose the account on which you wish to process this card transaction. If you only have one account setup then this screen will be skipped. You will then be prompted to choose the type of transaction you are processing i.e. Whether the card transaction will be a "Purchase" or a "Refund". Refund functionality can be restricted to certain users of the system if required. 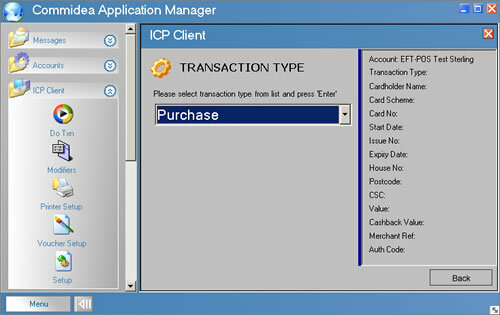 You are then requested to enter the transaction value i.e. the amount that you wish to charge or refund to the persons credit or debit card. You are prompted to enter or swipe the number of the credit or debit card. You are prompted to enter the Expiry Date of the credit or debit card. If it is a requirement for this particular card type to have the Start Date or an Issue Number then you will also be prompted to enter these following the entry of the expiry date. If Start Date or Issue Number are not required in order to process the card you will not be asked to enter these. If you have subscribed to the Address Verification System (AVS) then you will be prompted to enter the house number (or name if no number) of the card holder. The details given by your customer should be those matching the details printed on the cardholders's statement. Enter the postcode. As with the house number this forms part of the AVS system. If you have subscribed to the Card Security Code (CSC) service you will be prompted to enter the card security code from the back of the signature strip on the card. This is an additional card check designed to ensure that the person you are taking a card payment from is in possession of the card. The ICP software will then securely connect to the ICP servers using 128-bit SSL. Authorisation for the transaction will be obtained from the bank and the result of the request returned together with the authorisation code for the transaction if approved. The result of the transaction is then returned and shown. In this instance the transaction has been authorised by the bank. 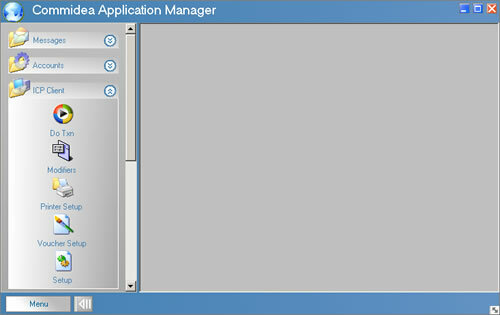 The authorisation code is shown on the right hand pane. You are then requested to confirm or reject the transaction. You should check that the signature (if applicable) is OK, that you are happy to accept the transaction given the results of the AVS and CSC checks (if applicable). If OK and all card details and the amount are correct you chould confirm that you want to pass the transaction through for settlement. Otherwise you can reject the transaction at this stage. The transaction is then securely confirmed to the ICP card authorisation servers and a confirmation message is displayed to you that the card transaction has been processed successfully. Occasionally transactions are not immediatley authorised by the bank but require you to call to check some further security details. 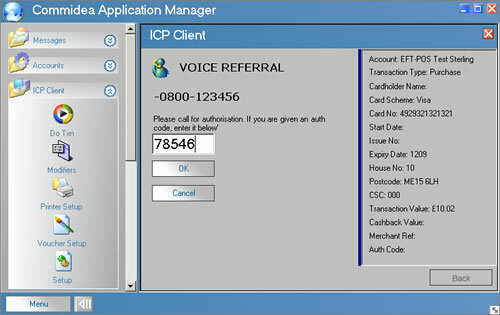 These transactions are known as voice referrals and in these circumstances this screen is displayed. After speaking with the bank an approval code for the transaction may be given or the bank may decline the transaction. 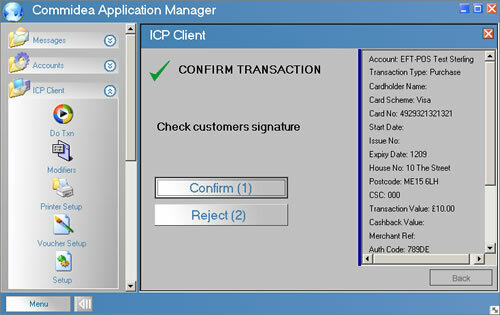 This screen allows you to enter the approval code given or to cancel the transaction as appropriate. 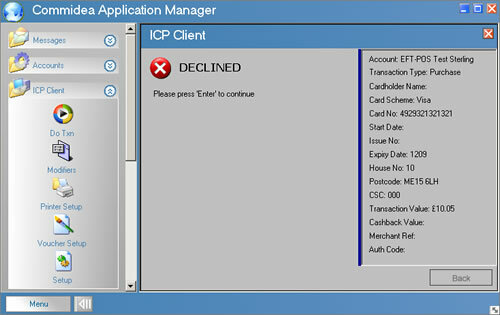 If the transaction is declined by the bank then the following screen is displayed indicating the declined result. You would then need to ask the customer for an alternative card or method of payment. The modifiers screen allows transaction types to be set or prompted for during the entry of a card transaction - for example to prompt for Customer Present / Not Present or to prompt for a reference to be entered for the transaction. 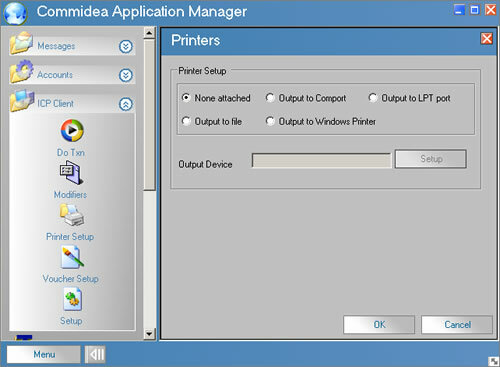 The printer setup screen determines whether a printer will be connected for the production of credit/debit card vouchers. 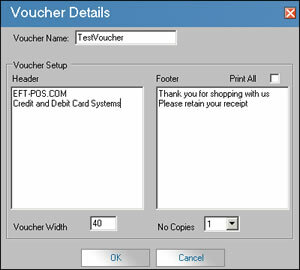 The voucher setup screen allows you to set header and footer text for credit/debit card vouchers if required.